Sep. 24, 2016 5:00 a.m. It was a smooth start to what will be a whirlwind tour of Canada’s west for the Duke and Duchess of Cambridge. 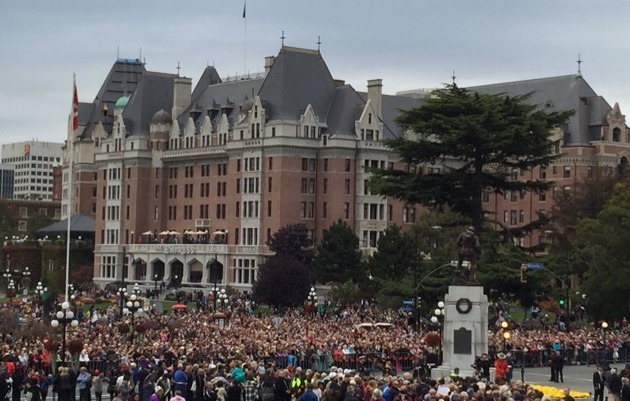 The Royal Couple were welcomed to Victoria with open arms Saturday evening, with a crowd estimated at 10,000 setting up around the Inner Harbour and on the lawns of the B.C. Legislature well in advance of the arrival of Prince William and his wife, Kate Middleton. 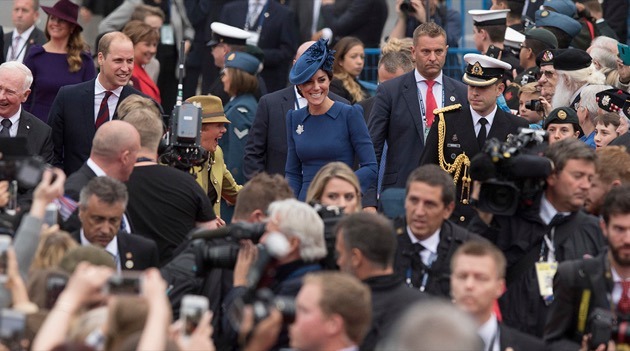 Having seen residents line the Pat Bay Highway on their trip in from Royal Canadian Air Force 443 Squadron in Sidney, the Duke and Duchess heard loud cheers erupt as they emerged from their vehicle in front of the cenotaph. They were immediately greeted by Prime Minister Trudeau and his wife, Sophie, Gov. Gen. David Johnston and his wife, Sharon, Lt.-Gov. Judith Guichon, and Premier Christy Clark and her son, Hamish, then waved to the onlookers before laying a memorial wreath to Canadians lost in the war in Afghanistan. As they made their way up the red carpet, the couple stopped for a lengthy chat with a couple of veterans at the fence line, as is their style. 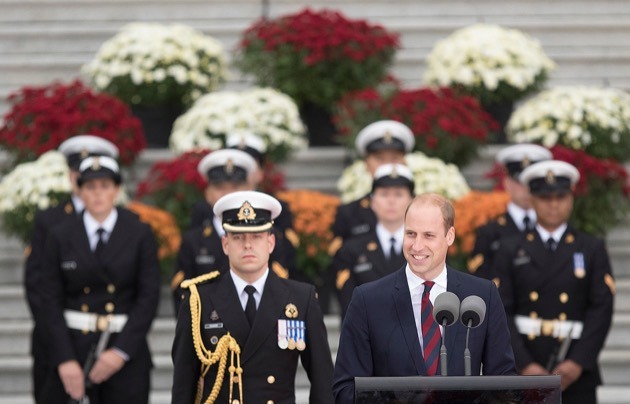 When it was his turn to speak from the podium at the foot of the legislature front steps, Prince William said he and the Duchess were “delighted” to come to Canada again, this time with their children, Prince George and Princess Charlotte. The Duke touched on the couple’s previous visit in 2011. “When we were last in Canada we had been married only three months. The warm welcome you gave us at that important moment in our lives meant a lot to us,” he said. In recognition of their schedule for the week, which will see them make stops at everything from the Cridge Centre for the Family in Victoria, to a pregnancy outreach centre on Vancouver’s Downtown Eastside, and experience First Nations culture in Haida Gwaii and the Yukon, the Duke hinted that he and his wife planned it that way. “Catherine and I have asked to meet as many people from as many walks of life as we can while we’re here,” he said. Later he gave kudos to the country as “wonderful place” and applauded Canada for “the great contributions it makes to peace, prosperity and human rights” on an international basis. Earlier, Gov. Gen. Johnston, the first official to welcome the Royal Couple, referred to Canada’s 150th birthday coming up next year. “Any celebration of Canada is by definition a celebration of the Crown,” Johnston said. William later acknowledged Canadians for their fondness and support for his grandmother, Queen Elizabeth, on the occasion of her 90th birthday and throughout her reign. During the welcome speeches, Prime Minister Justin Trudeau received the loudest cheers of all, even bigger than the Duke and Duchess. He thanked them for introducing “our part of the world” to their children. The Royal Couple were whisked away after the roughly hour-long welcome event to Government House, where their children were waiting. They are scheduled to be in Vancouver on Sunday then make a quick trip up to Bella Bella on the B.C. coast and back to Victoria on Monday.